Mark Cavendish describes the Champs-Elysees as "the most beautiful boulevard in the world" and after his heroics in Paris on Sunday, you can see why. But could The Mall replace that iconic strip of French cobbles in his affections if he becomes Olympic road race champion on Saturday? And after receiving a message of congratulations from the Queen this week, Tour de France winner Bradley Wiggins can be assured of some high-ranking support if he helps deliver Cavendish into a sprint finish in the shadow of Buckingham Palace. 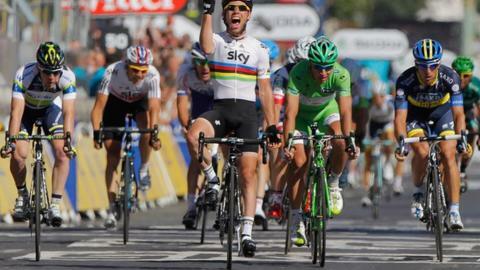 British Cycling is on an all-time high with Wiggins topping the podium and Chris Froome taking second place on the Tour, so all eyes will be on the home team on Saturday, to see if they can repeat the devastating display that saw Cavendish win the world road title in Copenhagen last year. And GB has the defending Olympic champion in action the following day with Nicole Cooke competing alongside the much-fancied sprinter Lizzie Armitstead in the women's race. The two time trials on Wednesday could see further British success with Wiggins bidding to add to his tally of Olympic medals (including three gold) and Emma Pooley, Olympic silver medallist in Beijing, also a favourite for the podium. And that's all before we head into the velodrome! There is no doubt Great Britain is the team to beat inside the fantastic new facility in the Olympic Park. They returned from the World Championships in Melbourne in April with five of the 10 gold medals available in Olympic disciplines. In China, GB won seven of a possible 10 golds and in some events secured two podium places for team members. Changes to the competition schedule after Beijing make a repeat of that virtual clean sweep unlikely. But in London the rules state there will be only one rider per event, per nation. This will mean some events will not feature the highest-ranked cyclists in the world. For instance, France has at least two men who could challenge for gold in the sprint while Great Britain's Sir Chris Hoy and Jason Kenny took gold and silver in the event in Beijing. Kenny has been selected to ride the individual sprint ahead of the reigning champion and it will be fantastic to see if he can fulfil the prediction Chris made in China when he put his arm around his GB team-mate after they received their medals. "This is the guy who'll win the gold in London," the Scot said. The men's team pursuit, which Britain won in Beijing, will be, for me, the stand out event. Four riders in perfect harmony, hammering round the velodrome at speeds of around 40kph. The top teams are incredible to watch, precision timing like a Swiss watch and managing to make such a lung-busting, muscle-burning four-and-a-bit minutes look effortless. Ed Clancy is GB's lead-out man and a gold medallist in Beijing, he says when it is going well it almost feels like slow motion. I'm really excited about that race and horribly nervous as well because Australia, with Jack Bobridge in their team, will provide formidable opposition, although it isn't a given that both teams will be in the final. The big star of the velodrome could be Laura Trott. She is a local girl from London and, pound for pound, is the most valuable member of the team on the track. Laura has an amazing character, but don't take her lightly. She can handle the pressure of competing in the team pursuit and omnium races. Everybody wants to see if Hoy is still as strong and hungry for success as he was in Beijing, when he won three gold medals. He's got a great chance of defending his kierin title. He's the reigning world champion after some pretty cute manoeuvring in Melbourne and is absolutely committed to living up to his unofficial label of team captain. It would be an amazing way to start the six days of competition in the velodrome if Sir Chris, Phillip Hindes and Kenny can blast their way into the team sprint final on the opening night. Hindes, born and brought up in Germany, is a recent addition to the senior squad but is progressing rapidly, quite literally. If he can deliver a 17.5 seconds or lower first lap, then the two Olympic champions behind him could join him on the podium. There are tiny fractions of a second separating the top sprint teams in the world so that will be a hotly contested event. And Jess Varnish will be the first British cyclist to push her pedal in anger on the Olympic track when she and Victoria Pendleton step up to qualify in the women's team sprint. Both are in cracking form and have been flying at the training camp in Newport. I would love to see world champion Pendleton successfully defend her Olympic individual sprint title. It is her last hurrah and she will want to go out on a high. Her rivalry with Australia's Olympic and world champion Anna Meares has provided us with some of the most dramatic moments on the track in recent years and, on home turf, Pendleton will be hard to beat. One man who will be standing in track centre, unfazed by the occasion but totally focused on every individual's performance, will be team boss Dave Brailsford. The British Cycling performance director has been immense over the last 10 years and his contribution has been phenomenal. His recruitment of key personnel, vision, drive and commitment have been outstanding. He's given the riders the platform and it's up to them to deliver. I have no doubt they will.